Absolutely chilly out there as we start a week of below freezing weather here. 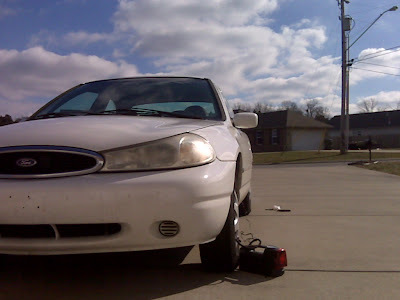 The car was driving like a log wagon Thursday so I finally checked the tires to make the cold weather adjustment. I was about 8 lbs. low in each tire. I wish I had been smart enough to check them before the wind chill was 15 degrees. On the first two tires I thought "This is not bad." By the third tire, I chickened out and sat in the running and warm car during the inflation. As I finished up the fourth tire, I had flashbacks to winters in Cincinnati and remembered why I moved. If Al Gore is correct, it should be like Miami here now. I'm thinking I may have to move even further south.